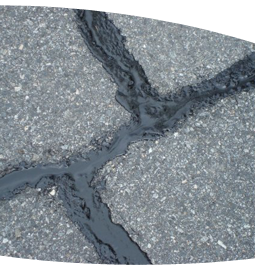 One of the most damaging things for any asphalt pavement is cracking. Cracks allow moisture to penetrate the pavement. In the winter, this moisture can freeze causing a multitude of more serious problems. In the warmer months weeds or grass can take root in the cracks causing extensive damage. There is one thing for sure; a crack is a future pothole waiting to happen. Pave-Tech can provide a cost-effective alternative to the inevitable asphalt replacement if cracks go untreated. 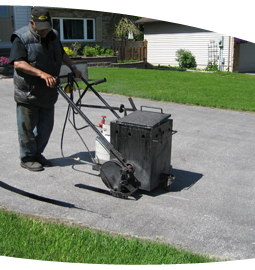 Pave-Tech uses only premium Hot-Pour Rubberized Injection to fill asphalt cracks. This product is heated and injected directly in to asphalt fractures creating a flexible seal with the existing surrounding pavement surface. Pave-Tech will professionally prepare your surface for Rubberized Crack Sealant ensuring proper adhesion and durability.